RAISE UR PAW NEWS: RAISE UR PAW TO HELP SAVE DUNAJ! We at RAISE UR PAW, a Not-For-Profit Incorporation, are in urgent request for your help and assistance in hopes of saving the life of an innocent Doberman Pinscher named "DUNAJ" - a life on death row who has one last chance to survive - but it is your voices and help that can achieve this goal. Thanks to one of our animal angels "Miss Stef", we were informed by her about the desperate and urgent need of voices and support to help save this innocent life, and we were more than happy to help and support the fight in any way that we could - and now we are reaching out for your voices and hearts to join along with countless others. As we read the NEWS ARTICLE in which we found -- it is apparent that Dunaj was not the one at fault in this issue, but a mere victim of cruel actions by one inebriated individual - and yet it is this dear life that will pay with his life, unless we can come together united and speak for his survival. According to an eye witness - it was stated that Dunaj was leashed outside a downtown store that his owner owned, when a man who was intoxicated kicked the innocent dog in the head without provocation - the dog immediately responded to the drunk man's violent act by barking at him, but in no way biting the individual. The inebriated individual then began barking back at the dog - apparently getting directly into the face of the animal. It was then that the witness ran over and shoved the man away and stood between the individual and the dog - the witness called 911 and the man was arrested by the North Bay Police. However, the article also stated that "Dunaj" was taken from his owner by the Health Unit and placed with the Humane Society -- and now the dear innocent animal is facing not only the tribunal, but also the fight for his life. The Pre-hearing Teleconference between the dog owner or his representatives and lawyer of the North Bay Health Unit, Christian Tremblay, is to take place Tuesday December 16th, 2014 and Wednesday December 17th, 2014 - which will apparently be closed to the public. We are hoping and pleaing that individuals will take part in raising their paws and voices in hopes of saving Dunaj - for time is ticking for this innocent life in need - and we at RAISE UR PAW, will also be writing to City Council of North Bay and even reaching out to get media attention to join the countless others in spreading this message and speaking out for man's best friend. 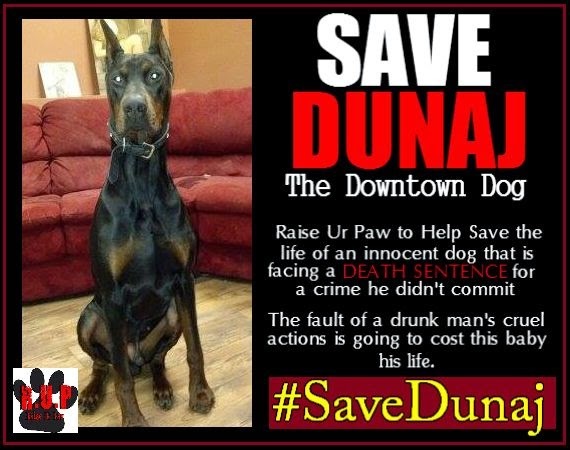 Please Support #SaveDunaj - Raise Ur Paw and Show you Care.